Here we go! The first Holiday Gift Guide of the 2018 season is dedicated to the preschoolers. I loved putting this one together - it is gender neutral (with some gifts available and linked in specific gender options), geared toward STEM learning and imaginative play, includes stocking stuffer ideas as well as a few bigger gifts and is perfect for kiddos aged 3-5. All of the gifts that Santa plans to bring Gray are included in this list and I can't wait for the big day! And p.s. 13 out of the 15 items are under $50! If you love this gift guide and plan to shop the post, please consider checking out in a web browser and not in an Instagram window or via an app. I do receive a small commission on purchases made via my links and unfortunately do not get credit for any sales made in an app (including Amazon) or via Instagram browser window. If a link from Olive and Tate is the last link you click before checking out, I will receive credit for your sale. Thank you so much for your continued support! Gray is obsessed with magnetic building blocks and, frankly, I am too because they lay flat to store and hurt a heck of a lot less than an LEGO when you step on them. We bring a little bag of them to restaurants with us, our preschool uses them for a learning station and the varying shapes prevent him from getting bored. Buy some, you need them. Magnetic puzzles are amazing for long car rides - they require a bit more patience than some of the activities on the list but are amazing for developing problem solving skills. I love this little kit for big boy time while the baby is napping - it has 76 (!) pieces from color dice to number cards, all of which can be used in various games to teach/improve math and fine motor skills. The little gripper set is my fave part and it works those pencil grabbing muscles and hand eye coordination needed for kinder. This year, Santa is brining Gray a tent for his playroom and I couldn't be more excited about it. My friend Courtney owns Tnee's Tpees and I had the pleasure of meeting her at an event not too long ago. She built Tnee's Tpees from a single maker business and her amazing work is now available in Target. We chose the printed mudcloth option (but, oh man, do I love that pink and white stripe) and have a cream tent rug and lantern to complete the set up. Because I love a theme, you'll notice that we're running with the camping motif and a lot of the gifts on this list are outdoor/camping/wilderness based! I'm here for the faux s'mores! I plan to break this little set down and wrap up each individual item as stocking stuffers from Santa. The tent will be all set up on Christmas morning so I think he'll be super excited to see all of his camping accessories as the morning unfolds. I also love this option for a more realistic camp out vibe. We learned the magic of binoculars on a whim while at Disney World - apparently, binoculars can take a regular wait in a long line and turn it into an awesome seek and find adventure. We'll take this pair on nature walks to hunt for birds, sticks shaped like magic wands and maybe a squirrel or two. For the little engineer! I really think this is the coolest idea - each kit comes with special tools to take apart and then rebuild the six included dinos. In our house, we'll only dole out one dino specie at a time so that the pieces don't end up all over my house the fun lasts forever. Also available in a "grow and glow" theme, this kit lets your kiddo to design, plant, water and grow their own terrarium ecosystem - and all pieces and parts are included so no extra work is required for Santa! I want nothing more than to teach my children the value of their individual selves and the importance of each unique human being they meet and since thats a huge, life long task, I'll take all the help I can get. The story in this book encourages everything from donating to others, caring for the Earth and the change you can be in the world. Plus, the cover is personalized which I know my big boy will think is the coolest thing ever. We had something similar to this over the Summer and it provided hours of distraction. It's fairly simple but crazy gratifying for them to dig out that plastic dino skeleton! This is, by far, my best discovery of the holiday season. The Teeter Popper is an award winning, sensory and imaginative toy that literally can be played with however a child wants - you can sit in it, stand on it, rock it, lay on it, balance on it - anything to get the wiggles out. It can be used as a standing work space or a way to "be still" and veg out without having to be still at all. The suction cups on the bottom provide stability and a sensory fulfilling popping sound that gave the toy it's name. Head to the link and watch the video, it's super cool. Want more gift ideas for a preschooler? Check out this post! Some of you may remember that we gave Gray a scooter for his 4th birthday gift - and while this is not the version we chose, we actually wished we had known about it prior to his 4th birthday! This scooter has the ability to be a sit and scoot that adjusts to a full standing scooter as your child grows. The handle bars adjust so much so that this scooter can accommodate ages 2-14. Also available in dino eggs, gems, fairies and sea life, we have these and love them. We pull out one egg at a time and Gray loves his collection of dinosaur figures from each egg. The kit comes with books to help identify your discoveries and the eggs can be softened a bit in water to make them easier for little hands to dig into. Anyone else have a preschooler who is supposed to be working on those cutting skills at home?? We got a set of scissors from school but this kit has the best cutting activities around. In my opinion, Melissa and Doug can do no wrong on educational toys and this set is absolutely worth grabbing as a stocking stuffer! Also available in My Ballerina Arts and Crafts Kit, this kit is amazing. It contains the pieces and parts to imagine, design, decorate and assemble your very own racer car or spinning ballerina. It comes with lots of extra design pieces so you can change the look and re-create your racer as many times as you'd like. Santa will absolutely be bringing this one to our house! Happy Shopping! 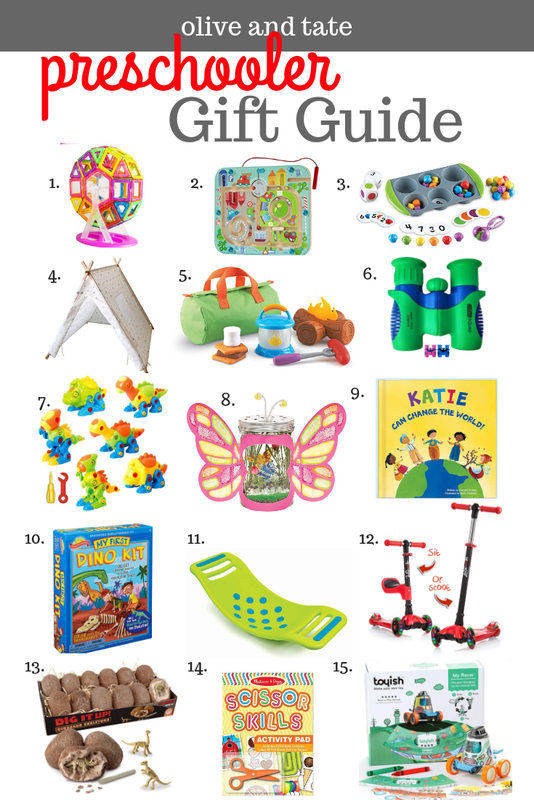 Don't forget to check out last year's Gift Guide for Preschoolers and last minute Amazon faves for Preschoolers and Babies!